Bavaria continues to expand its power series with the introduction of the new R-Line, a Northern climate targeted motor cruiser. The Bavaria R40 series is designed by JandJ and the Fly version is to be followed by a Coupe variant. The R40 will offer a living on the main deck, with galley to port side, and an L-shaped dinette to starboard. This dinette can join with the L-shaped aft deck settee and double its size in this form. Cabin layout for the R40 Fly is for a two large double cabins, with a full beam midships owner room, and a forward cabin. Both cabins have private en-suite facilities. Other notable features for the R40 Fly and it twelve meters of size are the spacious flybridge arrangement. 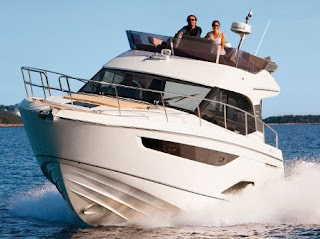 The Bavaria R40 Fly is to be powered by twin Volvo 330hp and or optional 370hp engines with stern drive propulsion.